DEP3321: To deploy this application, your deployment target should be running Windows Universal Runtime version 10.0.15063.0 or higher. You currently are running version 10.0.10240.17443. Please update your OS, or change your deployment target to a device with the appropriate version. If you want to deploy to 10.0.10240.17443 go to the Project Properties for your UWP project, and on the Application tab change the Target version to "Windows 10 (10.0; Build 10240)"
My OS is up-to-date. Windows SDK is also updated to latest. To be able to deploy to 10240, change Minimum to 10240 and then set Target to "Windows 10 (10.0; Build 10240)"
Are you trying to deploy to your development PC, to a mobile device, or something else? Thanks, I was able to run when I set the minimum to 10240. But I still don't get it, why am I setting this to 10240 when I have everything set to latest. SDK+Windows+Xamarin.Forms. Deploying to Dev PC (same as visual studio). I think the project structure is not correct, here's what I did. I created the Xamarin.Forms project in Visual Studio for MacOS with the following targets. iOS & Android barely have some code in it. All Content pages and navigation stuff is in shared project. The shared project is .NET Standard 2.0 Class Library type. Now I moved the whole solution to windows, and Added UWP Project into solution and with your help I am able to run. Now when I add Shared project as a dependency into UWP it says the following. "Error Project '..\TV\TV.csproj' targets 'netstandard2.0'. It cannot be referenced by a project that targets 'UAP,Version=v10.0.10240'. TV.UWP"
Now when I add Shared project as a dependency into UWP it says the following. Yes, .Net Standard 2.0 is not supported on 10240. 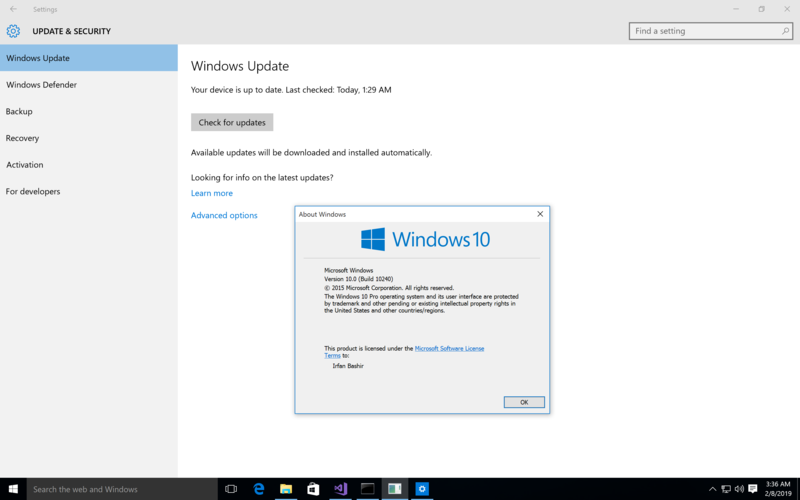 What is the version number of your Windows installation? I am trying Window 10 Pro, I have not activated it yet. Just trying it out. I have installed all updates and last update that I received was 1803. I tried to find the build version but in vain. I don't know what happens in that situation. Your screenshot is showing far less information than I see, so it's unclear what version it thinks is active from that. 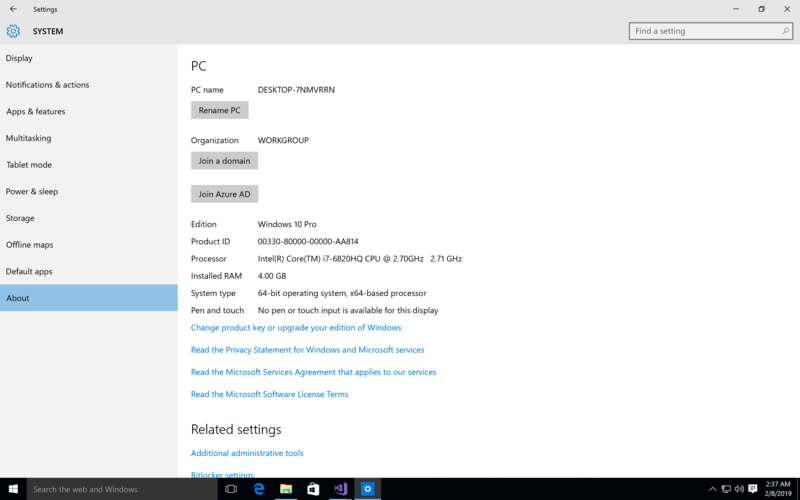 Try running Winver to see what that says for your Windows version. It's the very first version 10240. Does this stays the same, regardless of updates being installed? You can install the SDK's via the VS installer. No. Mine shows Version 1709 (OS Build 16299.904). I used to have 10240 (a long time ago), but have been applying updates as they appear (I have the automatic update setting in place). You'll need to update the installed Windows version in order to be able to use .Net Standard 2 in your XF projects. Don't know why, but the forums aren't letting me edit my posts today. To clarify, that last one should have said "in order to be able to deploy XF projects that use .Net Standard 2"
Thank you to both of you, I will not try to install all possible WSDK Version to see if I am able to include the Shared Project to UWP app. And will share results. All updates are installed, even if I manually tap on 'check for updates', it says all updates are installed. If that doesn't work I will try to install latest windows 10 from 1809 iso and see if that fixes the issue. No neither that's really helpful. I'll ask Alan what's up.